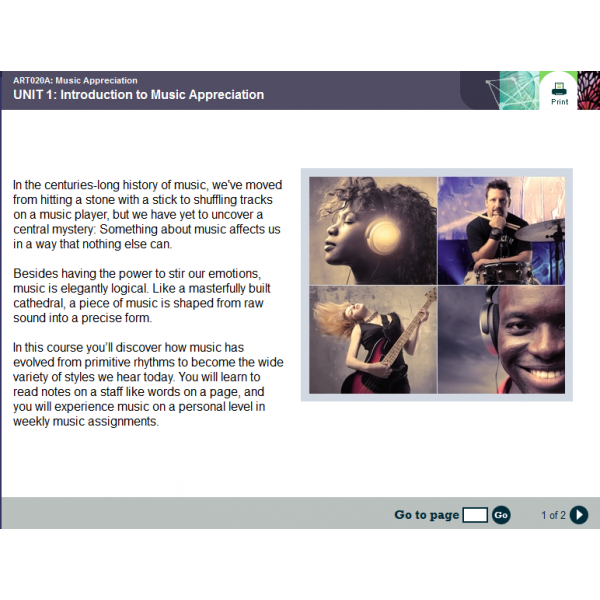 This Fine Art course introduces students to the history, theory, and genres of music. The course explores the history of music, from the surviving examples of rudimentary musical forms through to contemporary pieces from around the world. This Fine Art course introduces students to the history, theory, and genres of music. The course explores the history of music, from the surviving examples of rudimentary musical forms through to contemporary pieces from around the world. The first semester covers early musical forms, classical music, and American jazz. The second semester presents modern traditions, including gospel, folk, soul, blues, Latin rhythms, rock and roll, and hip hop. The course explores the relationship between music and social movements and reveals how the emergent global society and the prominence of the Internet are making musical forms more accessible worldwide. To comply with certain state standards for the arts, a student "performance practicum" is required for full credit each semester. The performance practicum requirement can be met through participation in supervised instrumental or vocal lessons, church or community choirs, community musical performances, or any other structured program that meets at regular intervals and provides opportunities for students to build vocal and/or instrumental skills. Parents or guardians will be required to present their proposed practicum to the students' teachers for approval, and validate their children's regular participation in the chosen performance practicum. Students develop an understanding of basic music vocabulary and apply it to Beethoven's "Symphony No. 5." They learn the different branches of musicology, including ethnomusicology and music theory, identify the musical skills and knowledge they already have, and set their personal performance and listening goals for the course. Students learn the historical path of music from the primitive world through Ancient Greece and Rome. They continue their study of music theory, learning how to write melodies and organize compositions around major and minor keys. Students look at the time period from the 6th century, when music was first notated, through the 16th century, when characteristics of modern music began to evolve. Over the course of that millennium, the concept of Western music as we think of it today developed. Students look at music of the Baroque period, including Vivaldi's "Spring" and learn to recognize major Baroque forms, including the concerto and the suite. They trace the development of musical instruments through the Baroque era. They study opera through Mozart's The Magic Flute, and look at Music of the Classical period, namely Haydn's "Surprise Symphony." They learn important contributors from these eras. Students look at Beethoven's music and how it influenced the composers that would follow in the Romantic period. They see the individuality of style and expression, the passion for the subject matter, and the inspiration found in the other arts. They study two other important composers from the Romantic Period and the 20th Century - Richard Wagner and Igor Stravinsky and learn about the changing importance of conductors in orchestral performances. Students review what they have learned and take the semester exam. Students explore the history of jazz, including some colorful personalities: Louis "Satchmo" Armstrong, Charlie "Bird" Parker, and "Dizzy" Gillespie. They learn about improvisation and collaboration, and how jazz is an indigenous American art form and a truly American way to understand ourselves. They also learn about a close cousin of jazz: American musical theater. Students learn about uniquely American art forms - blues, gospel, soul, and Motown music. They learn how different jazz styles borrowed from each other and blended together to create these art forms, and how the musicians who played them influenced American culture. Students learn about folk, bluegrass, and country music, which all have roots in the Appalachian Mountain communities of the American South, and share many musical characteristics. They tend to use the same types of instruments, and in many cases they share the same songs. Students learn about the traditional music in which it's rooted and explore the lives of the people who created it. Students learn the origins, evolution, innovators, and impact of rock-and-roll music on society and culture over the past five decades. Rock-and-roll appeared at a time when American society was poised for change. More than a music style, it became the voice of rebellion and antiestablishment for young people. Students learn about hip-hop, which began as an urban art form that directly addressed issues of racism, poverty, drug addiction, and violence. Students learn about hip-hop in the larger context of a cultural movement, which helps explain how it has influenced other musical styles, fashion, political activism, and more. They also investigate various music careers. Students review what they have learned and take the final exam.